Any airplane pilot will tell you, the most crucial part of flying is landing safely. Likewise, the most important skill you can have as a driver is the ability to stop when you need to. It hardly matters how cautious or capable you are behind the wheel when your brakes give out. That's why brake repair is so important. Engine maintenance will keep your car moving; brakes maintenance can prevent an accident, and not just in the most obvious ways. We've all seen it in the movies — somebody's brake lines are cut, and the car careens uncontrollably down a steep, windy hillside, unable even to slow down! Bad brakes don't typically work like that in real life. What's more likely to happen is the car in front of you will stop abruptly, and your car won't slow down quickly enough to avoid a collision. At worst, this can be tragic, and at best you'll find yourself at fault for an accident. It's not just failure to stop that may result in an accident. Brakes that work unevenly, or too far out of balance from one side of the car to the other, can create serious instability in your car's steering. This could cause your car to suddenly veer into another lane just at the moment that you mean to stop or slow down. From drastic brake failure to a loss of control that creeps up on you, routine brake repair service can prevent any of these scenarios. Properly maintained, a quality set of brakes can last up to 70,000 miles without being replaced. However, factors such as driving conditions, climate, and heavy use can lead to brakes deteriorating beyond repair after only 25,000 miles. 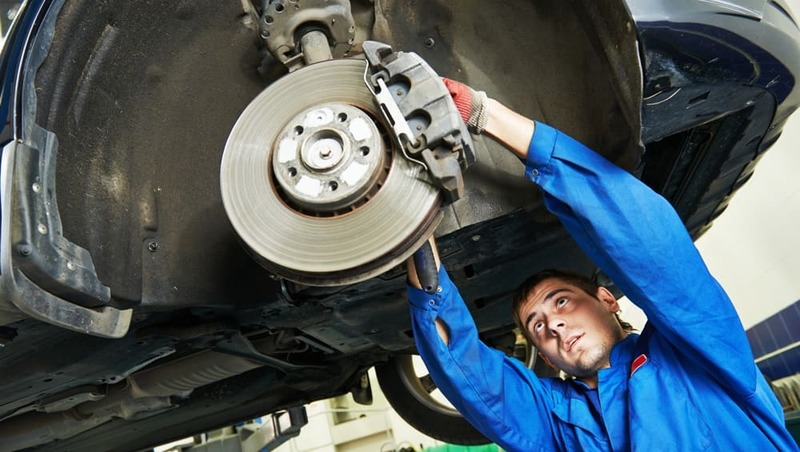 If you know what to watch out for, and have your brakes inspected during any routine maintenance, small problems that arise during the lifespan of your brakes may be met with a low-cost brake repair service. The lifespan of your brakes may be extended, for example, by replacing the surface of your brake rotors. However, wait until it's too late, and your brakes will need to be replaced prematurely. How do you know when your car needs brake repair service? There are several signs you can look or listen for. The most obvious will be screeching sounds when you brake — they can be subtle, or a deafening grind. Another clear one will be if your car starts to pull, or fade, one direction or another when you brake to slow down. Sometimes, a car will vibrate when the brakes need repair service. But a very nuanced thing to pay attention to is how responsive your brakes continue to be on a daily basis. Does your car come to a stop as quickly as it used to? Does the brake pedal seem softer, like it has a little more give when you push it down? Have any questions about extending the lifespan of your brakes, or brake repair service? Contact California Motor Works & Tires at (858) 560-1245, located in Kearny Mesa, San Diego.